[BB-Blog]: Unfinished hardwood drop-leaf table. This is a great deal on a pretty little kitchen/dining table that you can embiggen when necessary. Love it. If you've been searching for a table that's suitable for small spaces, but also want one that perfectly matches your home decor; this unfinished drop leaf table fits the bill. This small table can be painted or stained whatever color you wish. 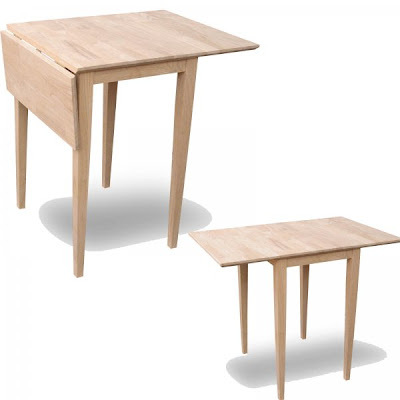 This table features Shaker style legs, and is crafted from solid hardwoods. When the arms of this table are folded down, the table measures 30"H x 18"W x 22"D. When the arms are extended, the table measures 30"H x 36"W x 22"D. Perfect for kitchen nooks or small dining areas.